The user GUID full of zeros lead me to believe that perhaps my CRM is getting a list of users from AD and is finding one without a GUID which caused an error. I connected SQL up to query Active directory to find out which user it was, but I was getting no further as everything seemed to have a valid GUID. 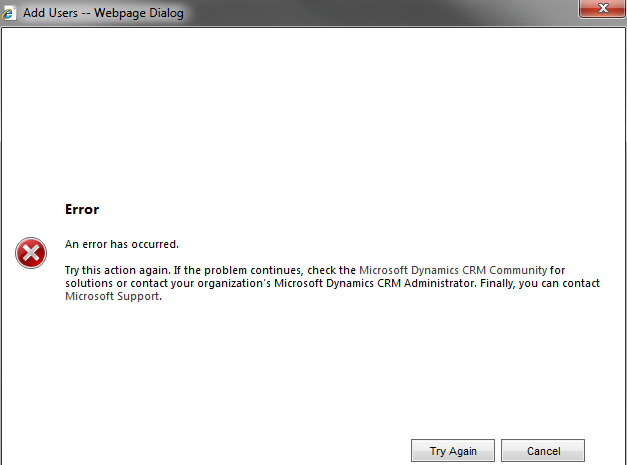 It seems that the CRM is trying to contact the domain xtbase.office. Now this domain was removed 3+ years ago, so I had no idea why the CRM would still be finding it. I used ntdsutil to try and clean up whatever was left over from the old domain, but there was nothing to clean up. Trusted domains! Finally, I ventured onto my PDC and looked in Active Directory Domains and Trusts. Under the properties of my domain, on the trusts tab, there was the problem domain. An outgoing and incoming trust for xtbase.office. I deleted the trusts from the list and tried the Add Multiple Users wizard again. Success at last! So the main lesson for today is: Read the error message, then read it again!